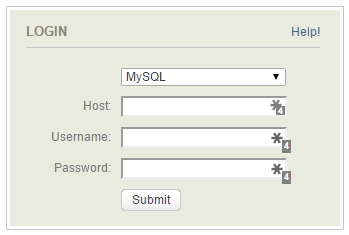 I want to install phpMyAdmin once on my main site and use it to manage multiple database server vps instances. At the moment, when you install phpMyAdmin, you will have explicitly set set in the config.inc.php the list of servers that you can connect to. so, on the login page, you will only see username & password input fields. Is it possible to somehow mod phpMyAdmin, so that it will accept any server ip/hostname on the login page, so you can login & manage any remote sql servers? Is the same possible with phpMyAdmin? Actually, the $cfg['AllowArbitraryServer'] exists exactly for this reason, so you don't need to modify phpMyAdmin for this purpose. Just edit your config.inc.php and add a line like $cfg['AllowArbitraryServer'] = true; and you should be all set. How to check phpmyadmin username and password wamp server?